Wanna join in the free writing Friday? 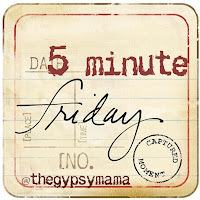 Head over to gypsy mama and link up. I should be sleepy. I should have a foggy mind. It should be cold and quiet. I should be short tempered (I mean I am Italian!). It's peaceful. The birds are singing good-bye to the night while they patiently wait for the sun to reappear. They know it will. There is no rush. No rush. No worries. Not really - should I be worried? No cars on the road. Well one old Chevy pickup, but it's not near us at all. I'm ready. I am going to be the mom who is awake and ready today- ready for whatever it is that this strange day might hold. Besides my three-year-old is explaining what the birds already know - the moon goes down, the sun comes up.... the moon goes down, the sun comes up. No point in rushing, the sun will come. I love your thoughts - you've put it down very poeticly! I am gonna peruse your blog some more - your writing is inviting. I like your approach of the theme: expecting the day - beautiful together with the photo! Glad I came across your blog!!! Stopping by from the aloha friday blog hop on local sugar hawaii blog...the first wednesday of each month we do a book hop...thought you might be interested. Aloha! Wow! Such neat way to put your thoughts together. Love this! Following you from the Blog walk. God bless you!